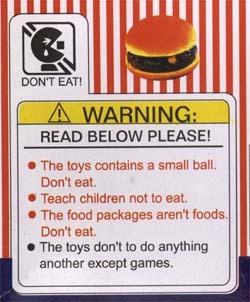 Teach children not to eat. Origin: The dollar store, of course. 2001. 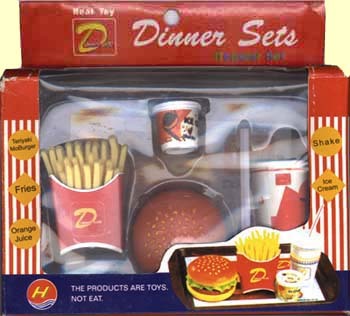 Miniature plastic food! 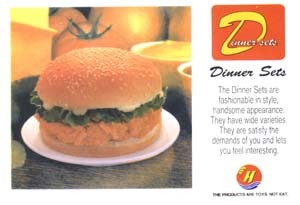 A near-faithful replica of a Happy Meal, no less — complete with fries, shake, orange juice, ice cream (mocha flavor), and the exotic-sounding Teriyaki MoBurger. Lets me feel interesting? I probably wouldnt have phrased it so delicately myself; but yeah, fast food does have that effect on me. According to the box, this was made in China. No, I couldnt do any better translating something into Chinese. I actually studied Mandarin for about a year, but that was almost a decade ago, and even then the TA routinely burst into fits of uncontrollable giggling at my mistakes. Shed never tell me what it was I actually said. So I feel justified in laughing at this. So should you. I think it would warm the translators heart to know that he or she brought a bit of laughter to the world. *They dont explain this game anywhere. How am I supposed to play?